This past week there was some panic selling in the PM complex, which is what we need to see happen to put in an important low. The HUI hit the 50% retrace at 195 for this first leg up in its new bull market, just under 200, which is an important physiological round number. Many times investor will place their sell/stops just under a round number like 40, 50 or 200 for instance, thinking if a stock drops below that important round number it’s time to exit that position. Many times a drop below these round numbers can be the reversal point for the next rally in the case of an uptrend. This first chart is a daily chart we’ve been following which shows the first impulse leg up and our first correction taking place. The 50% fib retrace plus the price objective for the small blue triangle comes in at the190 area, which is the tip of the strong buy point. As I mentioned last Friday the 190 area on the HUI is a place to start nibbling on your favorite precious metals stocks. If the HUI moves down into the brown shaded area, which I have labeled as a strong buy zone, this would represent your lowest risk entry point back into the precious metals stocks. 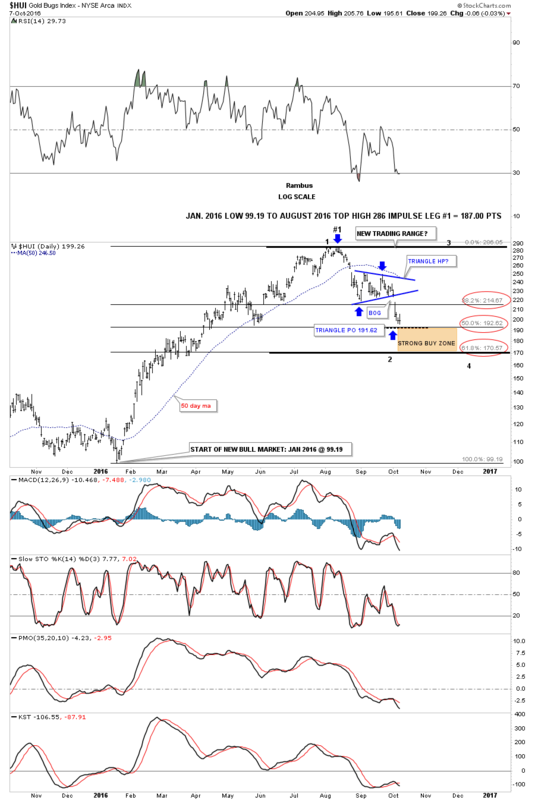 If the HUI were to break below the 62% retrace on a closing basis that would be the first red flag that the bull market in the PM stocks was in trouble. At this point in time this is a normal correction taking place in one of the strongest first legs up in history for the HUI. Emotionally it can be challenging to buy, when everyone is selling, as things are the bleakest at an important low. Price wise the 170 to 190 area represents the lowest risk entry point back into the PM stocks. Time wise it can be a little different as we could see a V bottom but most likely there will be some type of small reversal pattern form, such as a double bottom or H&S bottom, which would be the two patterns I’ll be looking for. Identifying this first low will be important to the big picture, as this initial low normally marks the low for the rest of the bull market, just like the January low has. We looked at this next chart for the HUI in the Wednesday Report, which has the closest fit to what we’re seeing for our current correction. After bouncing for a day or two at the price objective in 2003, the HUI then capitulated down to the bottom at 92.82, which marked the end of reversal point #1 and the beginning of reversal point #2 back up. That low at 92.82 was never approached again during the rest of the bull market. Also note the price action doesn’t have to rally straight back up to the top of the trading range. We have no idea how long this correction may last but the odds favor some type of consolidation period should take place after such a big initial thrust out of the January bottom. 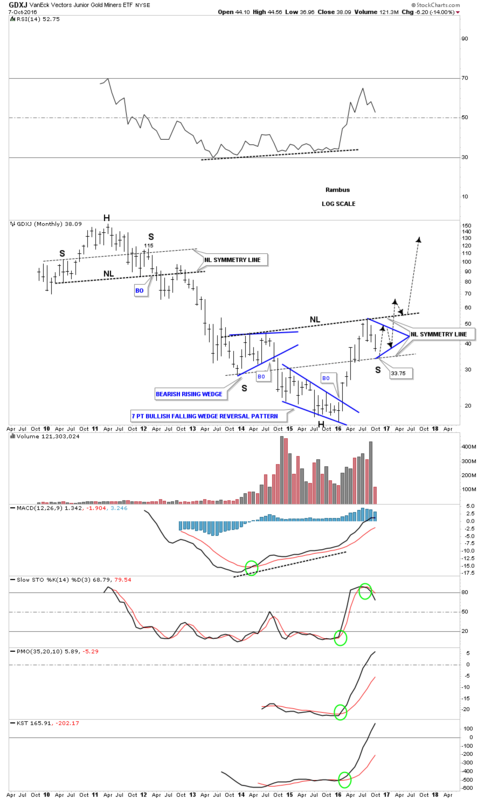 I would like to show you a long term monthly chart for the GDXJ which embodies the Chartology for the rest of the precious metals stocks indexes. If we are truly at the beginning of what may become one of the greatest bull markets of our lifetime then we should see a massive base in which to launch this bull market from. 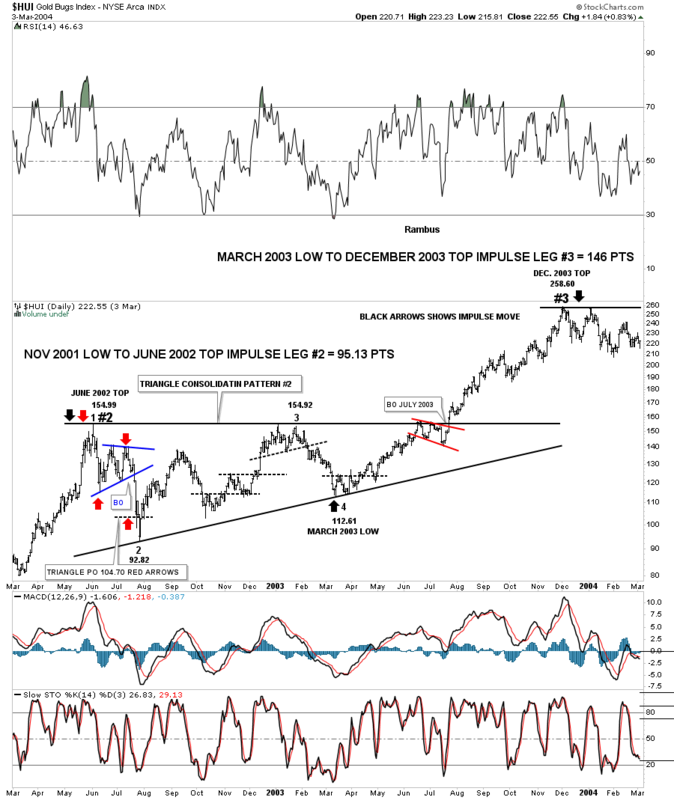 This monthly chart below shows the entire history for the GDXJ which was born during the later phase of the 2000 bull market when it formed its massive H&S top along with all the other PM stock indexes. For over three years now the GDXJ has been building out a massive inverse H&S bottom with the possible right shoulder under construction presently. The neckline symmetry line shows the 33.75 area could mark the low for the right shoulder. This is exactly what happened during the formation of all the big H&S tops, in all the different PM stock indexes in 2011. The neckline symmetry line nailed the right shoulder highs, which actually started the bear market. This chart also shows you how from a time perspective, it could take six month or so to complete some symmetry to the left shoulder, possibly building out a triangle or falling wedge to complete the right shoulder. When I look at the potential for this massive H&S bottom I get the same feeling I had when I saw all the massive H&S tops forming in 2011 for the PM stock indexes. It was so obvious but most investors never saw that massive H&S top until well after the bear market began. There was one short post I did as a, Late Friday Night Chart in which I labeled it, The Elephant in the Room, as the H&S top was so obvious but few seen it in real time. Keep in mind things were very bullish in the PM complex back in 2011 when the head was formed. It was just the opposite when the head was formed in January of this year after one of the greatest bear markets of all time ended just under 17.00. The 33.75 area, at the neckline symmetry line, could equate to the same area as the top of the right shoulder in February of 2012, when the GDXJ was trading at the neckline symmetry line around the 115 area. That area marked the absolute best shorting opportunity available. The 33.75 area at the bottom of our current neckline symmetry line could mark the absolute best buying point for this next phase of the bull market, when this potential massive base is completed. After nearly three years of base building the GDXJ looks like it’s in the finishing stages of completing a massive H&S base, which is what we need to see, if we’re going to see a once in a lifetime bull market. Big patterns equals big moves. 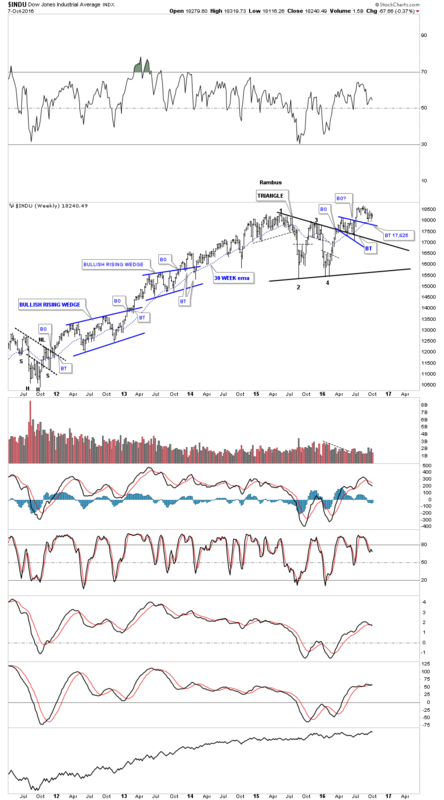 After the BREXIT vote and using the INDU as a proxy for the other stock market indexes the INDU rallied up strongly to a new all-time high at 18,668, where it put in a small double top during the dogs days of summer. The price action broke below the double top trendline in September and has been back-testing that DT trendline ever since, creating another small S&R line. If the INDU breaks below the S&R line it could decline down to the top rail of the blue expanding falling wedge and the 200 day moving average, around the 17,625 area which should offer strong support. 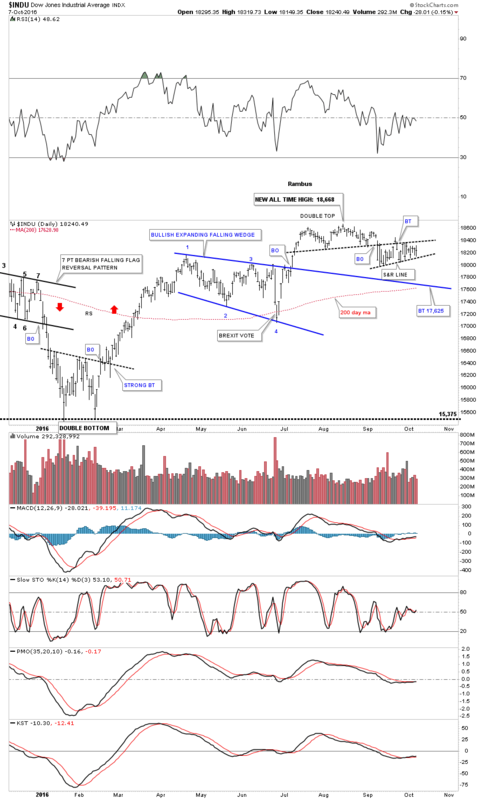 The weekly chart for the INDU shows you the big picture and why the 17,625 area should offer initial support at the top rail of the blue expanding falling wedge and the 30 week ema. Except for the BREXIT vote, which is the spike below the top rail of the expanding falling wedge, the INDU has been acting in a positive manner for all of 2016.